The fifth and final installment of Truffaut’s autobiographical saga once more follows Antoine Doinel (Jean-Pierre Leaud), now in his thirties, as he struggles, as ever, with the vicissitudes of life and romantic commitment. At the start, Antoine and Christine (Claude Jade) are in the midst of a divorce, while his relationship with new girlfriend Sabine (Dorothee) is beginning to deteriorate. A chance encounter with Colette (Marie-France Pisier), the girl he was infatuated with in Antoine and Colette and now a lawyer, complicates his life even further, especially when Christine and Colette begin conspiring to improve his life. After losing Sabine and unable to decide what he wants, Antoine seems destined to remain in perpetual adolescence, until he comes to grips with the intensity of his own emotions and accepts that sometimes "forever" can only be understood in the context of what is happening in the here and now. L'Amour en fuite is unarguably the weakest of the five films in the Antoine Doinel cycle, reminiscent of the "clip show" that many US sitcoms were once obliged to do at the end of each season, clumsily inserting flashbacks around a loosely woven plot designed to hide the fact that the substance of what you are seeing is mostly just filler. It's no wonder that Truffaut himself said that he hated this film, labelling it "a swindle". He had not intended to return to Doinel after Domicile conjugal, but because Doinel was a popular character he was hoping a sequel might be a monetary success. Shot in a hurry after completing La chambre verte, a far more serious affair, he didn't have time to finish the script and his attention was elsewhere anyway, occupied with other projects. Still, he did get one thing right - the public loved the film and it brought in the necessary funds to keep his production company afloat. 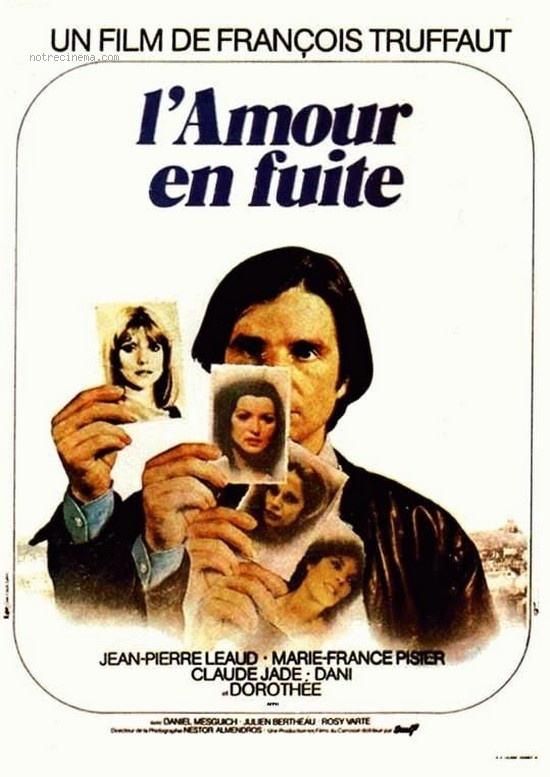 For all of its faults, L'Amour en fuite is still a watchable and entertaining film for what it is, especially for fans of the previous films in the Doinel series. Interspliced with clips from the previous four films, its chief strengths are the enduring likeability of its stars (Jean-Pierre Leaud is no less charming or affable, despite a distinct lack of meatiness in this particular role) and in a few added morsels of autobiographical detail from Truffaut's own life, including a scene where Doinel meets his mother's ex-lover (Julien Bertheau, reprised from Les Quatre Cent Coups), something Truffaut experienced as a young man. It's not a masterpiece, but it works as a conclusion to the Cycle and the ending - like Truffaut himself - is left pleasantly open-ended, curious, and still searching for meaning.